The third suborbital test that had been originally announced for January 2018 launch not surprisingly had been repeatedly delayed due to technical issues until the summer of 2018, when the company decided to completely stand down that rocket and use it instead for testing. Subsequently they have conducted a number of different tests with it, including about a dozen vertical static fire tests as well as countdown dress rehearsals designed to work out the details for fueling and unfueling their rockets during launches as well as training their launch teams at the launch site and at mission control. “We realized that this rocket would be much more useful to use as a testbed that can be used repeatedly in many different ways than as in a single one time test flight,” Cantrell explained. 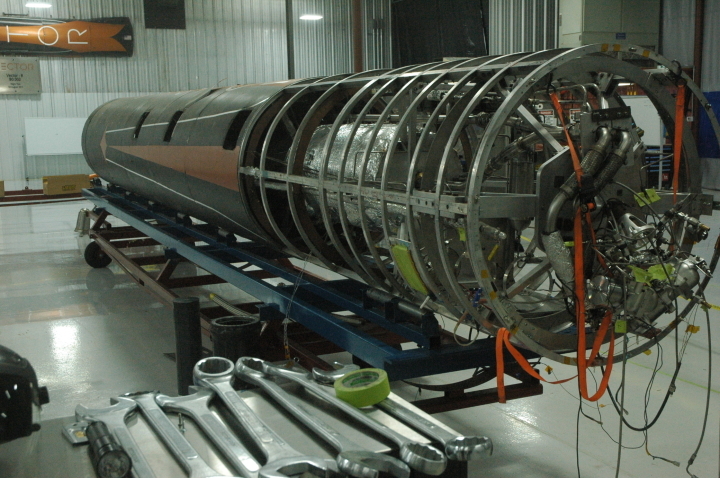 The image below shows this test rocket as it sits in the Vector rocket assembly building in downtown Tucson. Even with this decision, they had still hoped to make their next launch, #4 in their original test schedule, by the end of 2018, from Alaska. This test would test the first stage from launch to main engine cutoff, followed by first stage separation. They would then do a valve and ignition test of the second stage, where they would simulate ignition but with water instead of fuel. The flight would get the second stage up to about 70 miles, thus placing it in space, though not in orbit. When the GPS component in their flight termination system (the system used to abort a flight during launch) had problems, they were forced to reschedule this flight from December 2018 to March/April 2019. Cantrell noted that they give themselves a 70% chance of meeting that date. 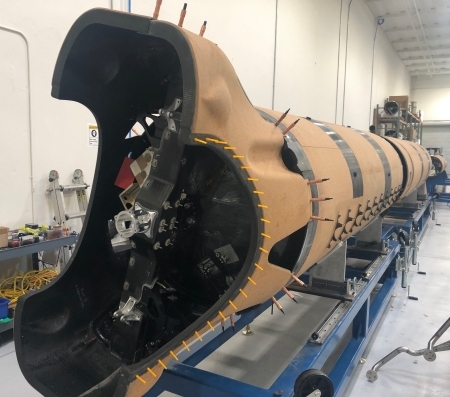 At present they are assembling the rocket at their California facility, and plan to do a vertical static fire test of the first stage at the engine test facility north of Tucson prior to that March/April launch. The image on the right shows that rocket during assembly in California, looking at the rocket’s base where its three engines will be installed. His confidence seems reasonable, based on the significant capital the company has raised, and based on what I saw during his tour. The image below shows the main assembly floor of their Tucson rocket assembly facility. In the background behind the flagging tape you can see the rocket now used solely as a testbed. In the foreground are two of their future rockets, their fuel and oxygen tank sections lined up with one in front of the other. In rooms off to the side of this main assembly floor they have a machine shop as well as facilities for carbon winding the tanks and engine parts. 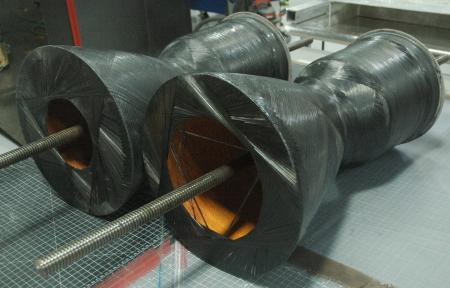 They also 3D print many of their rocket engine parts. The image on the right shows the nozzles/ignition chambers of two partially built engines shortly after a carbon layer has been wound around the outside of the inner ablative structure. Cantrell next took me to their engine test facility, located in the desert about twenty minutes north of Tucson, where they do all static fire engine tests, including the vertically stacked tests of the rocket’s entire first stage. 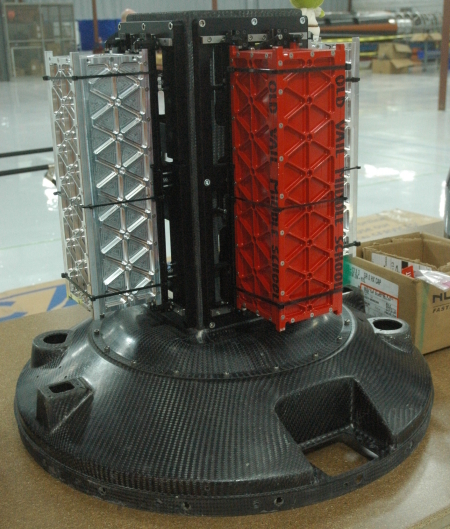 The image below is of the mobile launch platform they use to transport and launch their rockets. They call it the TEL (Transporter, Erector, Launcher). As they are presently between launches, it is essentially in storage, covered with tarps to protect it from weather. For launch the strongback lifts the rocket to a vertical position at the left end. For transportation they attach a truck to the right end. Imagine passing this on the interstate with a rocket on board. It has happened, and it will happen increasingly in the coming years. When we arrived at the test facility they were preparing for a series of static fire engine tests of a second stage engine. 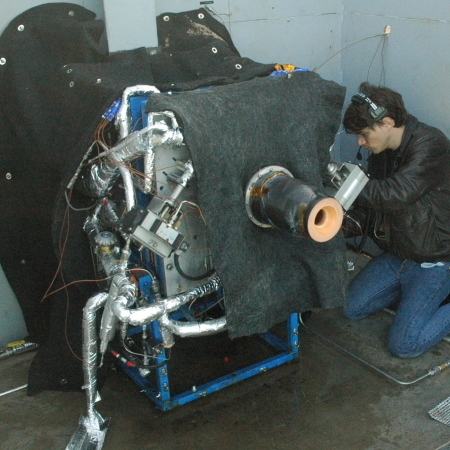 The photo on the right shows propulsion engineer Chris Boswick as he preps the engine and test equipment. When I took this picture they were hoping to get the test off in about an hour. However, they do not rush things at this stage, as forgetting to do one tiny task can ruin the test. One hour turned into two, then three. When they were about to fire the engine for the first five second burst, just before sunset, their sensors detected a valve leak and they had to abort. While they were going to try to get it fixed and fire the engine that night, they figured it likely that they would need to come back the next day, so at that point I decided it wasn’t worth waiting any longer. Cantrell has promised that I will be invited for later and much larger tests, such as when they mount the March/April rocket for a dress rehearsal vertical static fire test prior to that launch. In conclusion, Vector is without doubt in the business of making and launching of rockets. Whether they survive of course will depend on those initial launches later this year. While they might have a launch failure or even two (as SpaceX did in its early days with the Falcon 1), they will eventually have to perform, or the investment capital will dry up and they will run out of money. Right now, however, I suspect that they will be able to weather at least two failures, since the demand for these smallsat launchers is increasing at an amazing rate, and right now there is only one company (Rocket Lab) that is barely operational, and only one other company (Virgin Orbit) even close to its first test flights. There is opportunity here to make a lot of money, and it appears that investors have recognized this fact by pouring substantial capital into the industry. Excellent article thanks Robert. I hit the tip jar in appreciation, hope others do too. What a wonderful tour and trip report. It looks like Vector is making good progress, despite starting over rather than continue tinkering with their technically challenged third rocket. 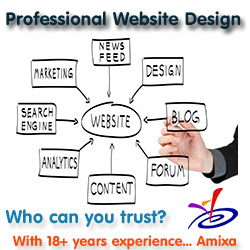 You presented interesting news on the designs and methods. I appreciate the news on the test plan. The larger test has better potential to be more interesting. It should give you a better sense of how ready they are for their orbital attempts. Did I write “despite starting over“? I should have written “because of starting over.” You can spend forever trying to fix something at a time when it is better to build the thing right.